There are many species of cockatoos, but the most common species seen in captivity (in no particular order) include the Moluccan, Goffin's, umbrella, sulfur crested (greater and lesser), and bare eyed cockatoos. Cockatoos range in size from about 12 inches to about 27 inches. Those on the smaller size include Goffin's cockatoo and the lesser sulfur crested cockatoo, while the larger cockatoos included the umbrella, Moluccan, and greater sulfur-crested cockatoos. With proper care, cockatoos can be expected to live for about 40 years (smaller species) to 80 years or more (larger species). Unfortunately, many in captivity die younger than this. Cockatoos are very lively and affectionate birds. They are quite "cuddly" and bond very closely with their owners. However, their sociability and need for affection mean they demand a great deal of time from their owners. Deprived of affection, cockatoos will become depressed or exhibit neurotic behaviors. They are intelligent, playful, mischevious, and they can be exceptionally loud. They are somewhat excitable so sometimes don't do that well around young kids. Cockatoos aren't as well known as some of the other parrots for their ability to mimic speech, but in general, they do have pretty good speech capabilities. There is a lot of variation between individuals as well as likely some species variation. Smaller cockatoos should have a cage no smaller than 24-by-36-by-48 inches with a bar spacing of 3/4 inch to 1 inch while the larger cockatoos need a very large cage: about 24-by-48-by-48 inches with a bar spacing of 1 inch to 1.5 inches. The larger the cage the better. A strong cage (wrought iron, stainless steel) is necessary to withstand the cockatoo's tough beak. Horizontal bar wires will allow the cockatoo to exercise by climbing on the sides of the cage. Cockatoos love to chew and destroy things, so providing chewable toys is a necessity. Softwood toys, tree branches, vegetable tanned leather, rope toys (supervise use), bells and cardboard can all be given. Provide both hanging toys and toys that can be picked up in the feet. Toys with hanging strands simulate preening and are popular with cockatoos. All bird toys must be safe, and hung safely. Cockatoos need a variety of fresh foods along with a good quality avian pellet based diet. Pellets can be up to 50 percent of the diet and fresh foods (vegetables, fruits, grains, etc) you prepare should make up the rest. Seeds and seed mixes should only be used as a limited treat item since they are high in fat. Nuts can also be used as a special treat. Cockatoos produce feather dust. Special feathers (powder down) produce a fine powder used in preening. 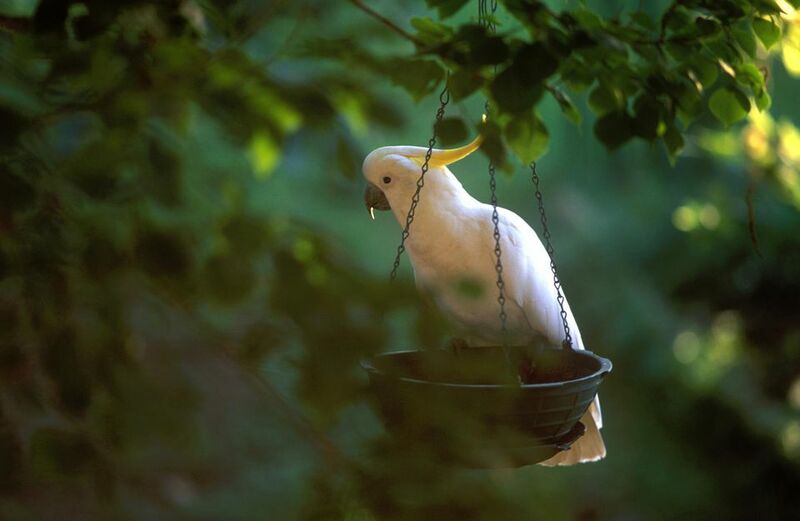 This powder makes a fine dust that settles throughout the homes of cockatoo owners and can cause allergies. Owners need to be prepared for a bit of a mess and having household items chewed. Cockatoos tend to like to play with (toss) their food and chew on everything. Cockatoos seem somewhat prone to neurotic behavior including feather picking and self-mutilation, especially if denied the affection and attention they need so strongly.